Yesterday I showed you my go-to jewelry pieces. However, those are just the ones I keep in my personal collection. 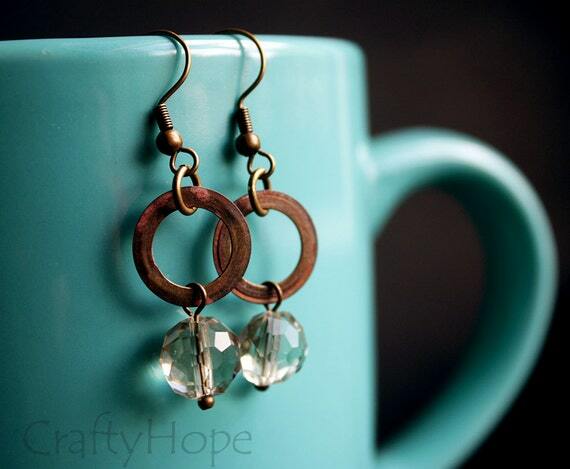 My favorites to grab are from the CraftyHope Etsy Shop. Here's a few of the ones I gravitate toward most often. 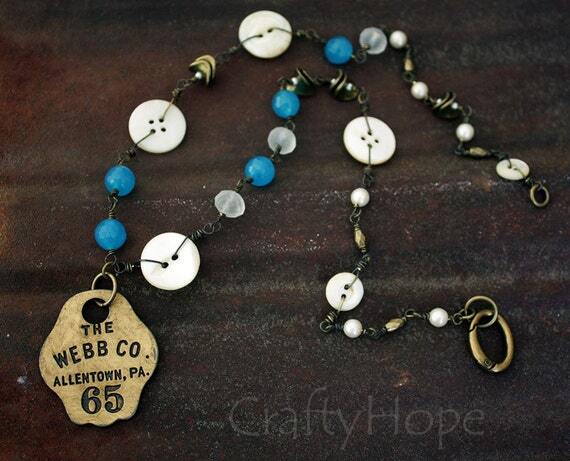 I'm drawn to the Webb Tag Necklace because it consists of mother of pearl buttons, bright blue stone beads, and that awesome vintage tag. Yum! It's a longer necklace and is great for adding a little something to a plain shirt. 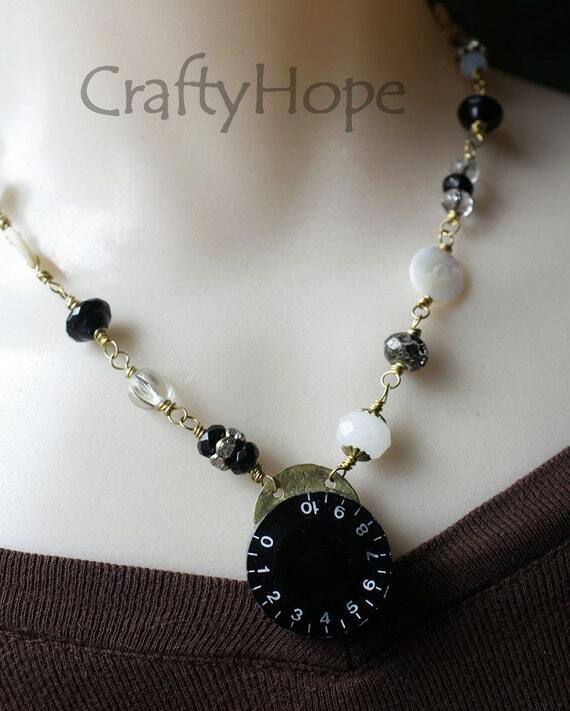 The Pump Up the Volume Necklace has a guitar knob as the focal. How cool is that? It's a shorter necklace than I usually make or wear and is perfect for when I'm wearing a top with a lower neckline. The simple palette of black, white, and brassy gold-tone helps it match just about anything. And, the faceted beads and rhinestone spacers help dress up something that may be a little more casual. 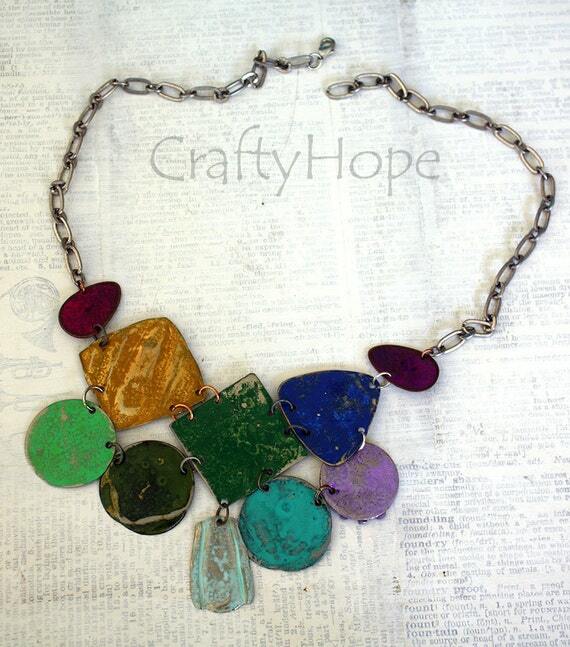 Oh, how I love this Smashed Rainbow Necklace! The components are made from old jewelry pieces from the thrift store. Some of them were puffed metal earrings from the 80's that I smashed flat (hence the name). I colored the pieces with Vintaj Patina, laid them out in a rainbow pattern, and punched holes so they would lay out in that pattern. I wore this necklace not too long ago with a basic black dress, and it made just the statement I wanted - adding color and interest to a plain outfit. My Crackle Spool Necklace is a for sure favorite. I made it as part of a jewelry challenge to incorporate a spool into a piece. With paints and crackle, I altered some paper and sealed that into the center of the spool. Thin chain was inserted into the hole of the spool to make up the chain of the necklace as well as a base for an array of charms. You can see more detail about the piece in its description (click the link above). 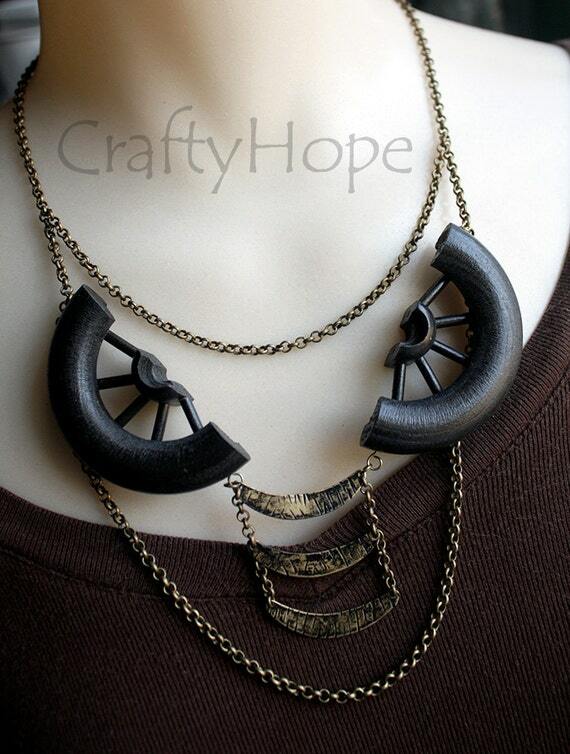 Like the spool necklace, this Altered Wooden Wheel Necklace was the result of a challenge. Each participant was sent a wooden spool to work into a jewelry piece somehow. I asked Pat to cut it in two and drill some holes. From there the halves were painted, chain was added, and brass blanks were altered and hung. It is a serious statement piece and unlike anything you will see anyone else wearing. I love it for that alone. These Folder Ring Earrings have been worn a time or two as well. The 'folder rings' were indeed rescued from old folders that came in a desk we bought. I aged the rings with a vinegar-salt solution and sealed them. 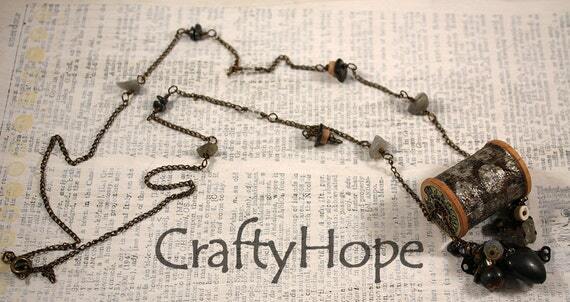 The faceted glass beads have a tiny bit of a smokey color and accent the rings perfectly. I adore the simplicity of these earrings that could be worn everyday. I know, I know, all but one of these are necklaces, but that's just how I roll. However, I do have some awesome handmade earrings and bracelets in the shop too. Unfortunately, I just can't wear everything I make. I have to save something for you to enjoy also. What pieces in my shop would you wear most often? those tiered moonstone earrings are a definite go-to! Ooo, and the pearl and sparkle! And the Lamp Finial Necklace ~ quite unique, beautiful,and fringy! I don't see it but you had a toasted marshmallow bracelet for a while. That would be one I would wear a lot too. I always enjoy seeing the new life you give all your finds! LOVE the smashed rainbow necklace! Thanks Jenna! That seems to be the popular one right now. It's perfect for a pop of color. :) Thanks for strolling by.